Manchester City’s midfield magician David Silva handed Pep Guardiola’s side the lead against Shaktar Donetsk in the 13th minute of the Champions League tie. 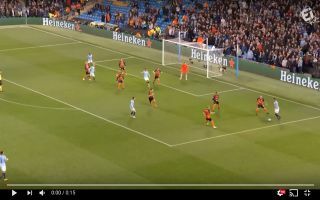 City summer signing Riyad Mahrez tricked his way past two helpless Shaktar defenders before firing in a low cross with his right foot across goal, Silva was on hand to tap in and give the Citizens the lead. Manchester City are looking to finally make the impression they have been longing for in recent years in this season’s Champions League.